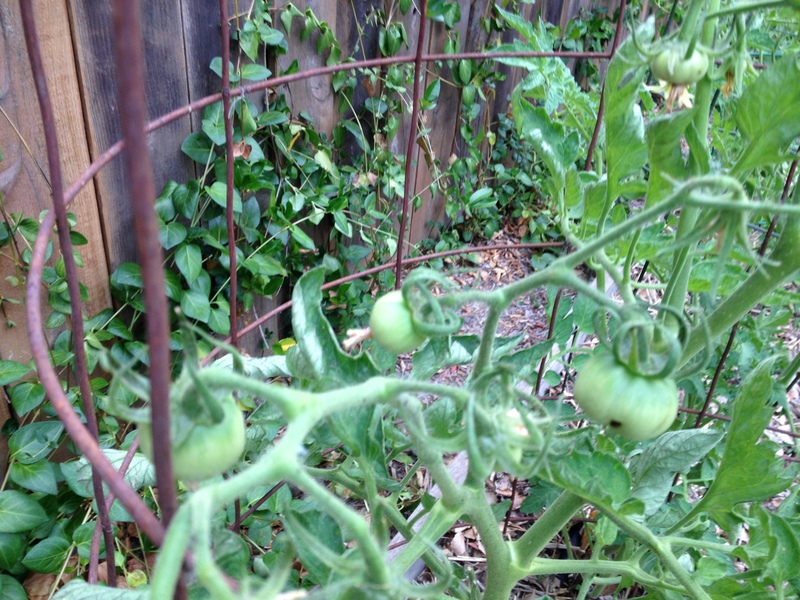 We are just a few days away from summer, so I thought I would give a garden update. Some things are really starting to take off, the beds are filling out. In other cases, I am throwing up my hands and counting my losses (already). So here goes. 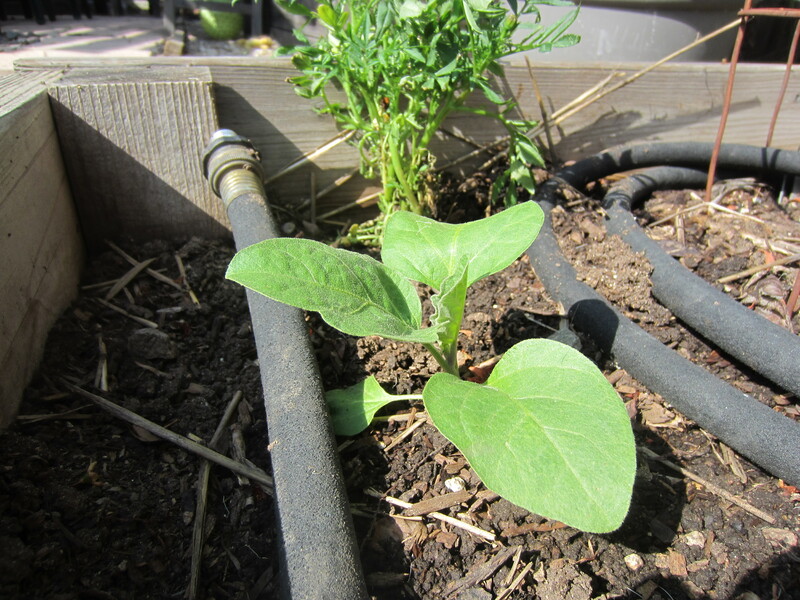 Success: The pole beans and the zucchini plant adjacent are doing very well. This photo was taken earlier in the week, and those bean vines are probably twice as tall. Disappointment: I didn’t get a picture, but in the bed just next to this one, the bush beans are yellowing rapidly. There is still new green growth, but I am afraid that they may have a mosaic virus. Boo. 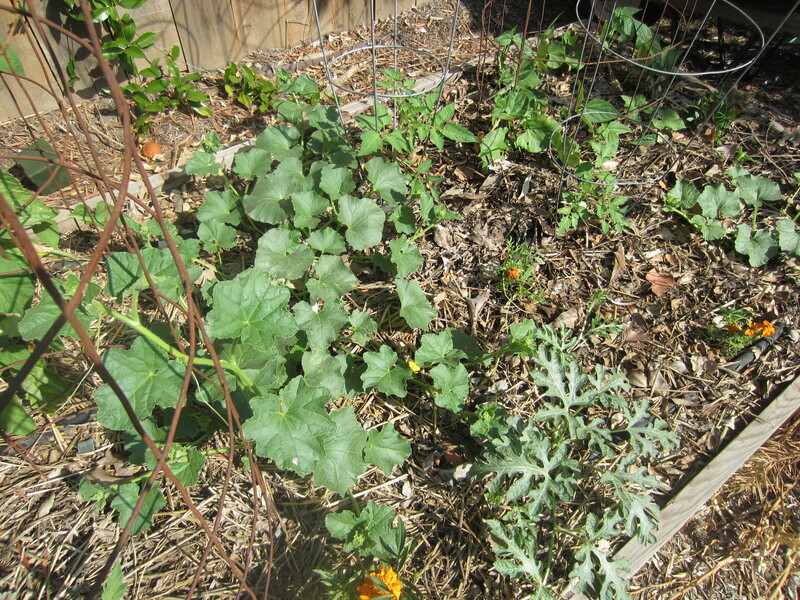 Success: This bed is a mix of stuff: four tomato plants, two musk melons, a yellow water melon, a basil plant, and pole beans. All doing very well. This picture was also taken earlier in the week and the melon vines have also doubled in size. I think I may need to get at least one of them vertical or the melons may take over the bed. Disappointment: I didn’t take a picture because the plants are so small you would have to search around for them amid the mulch. I cannot get my pepper plants (save one) to grow! They have been about an inch tall for over a month, and I just got peppers from a neighbor who has a plant already producing! I may go back on my “plant only from seed” commitment and see if the farmers’ market this weekend has any organic pepper seedlings. I cannot imagine my summer garden without peppers. 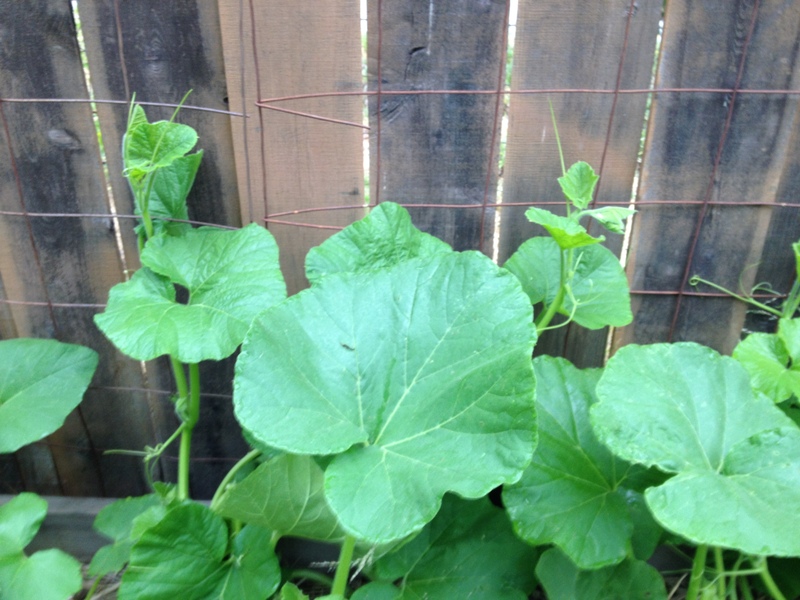 Successes: The hard squashes are taking off and beginning their climb up the lattice. My first tomatoes have set with many, many more on the way. 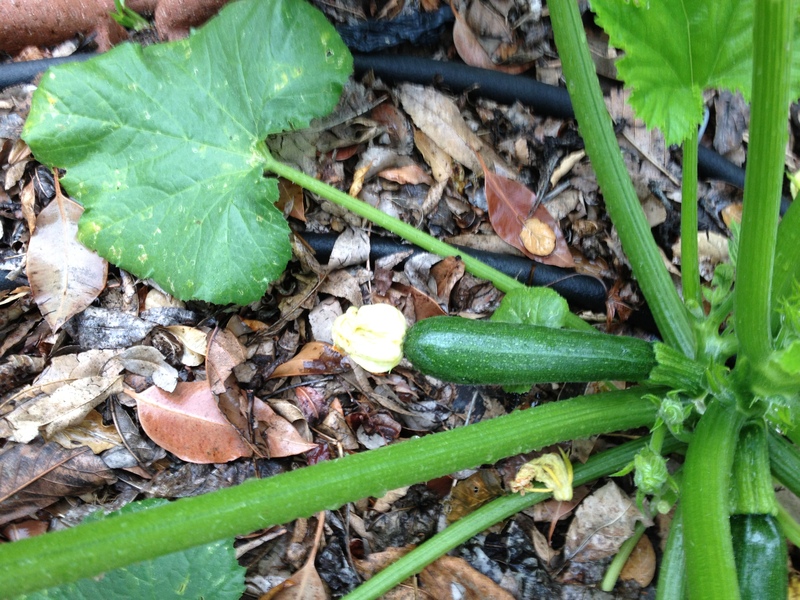 I harvested the first zucchini this morning. The second one to come is shown above. 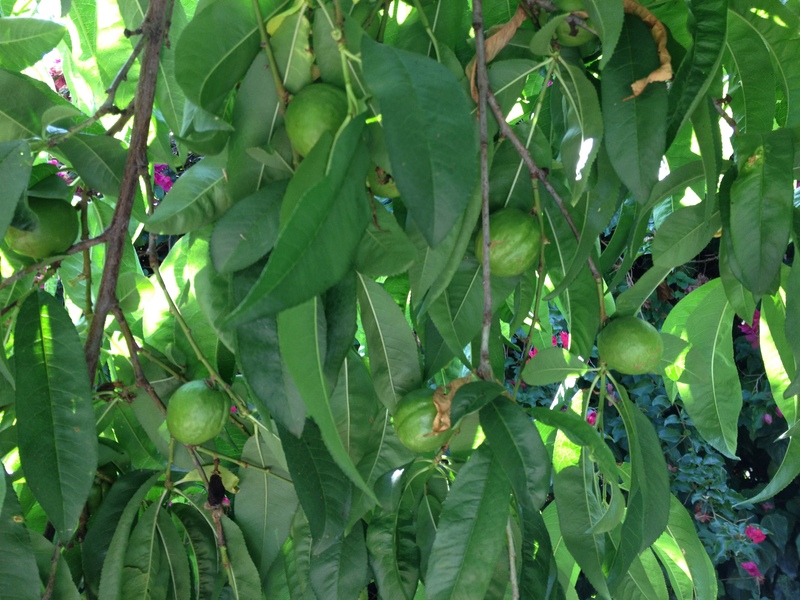 Success: Our plum tree only has about 10 plums on it this year. We usually get at least 100. I am not sure what happened, but the ones that are on there are plumper than ever and just starting to turn the purplish red they will become. 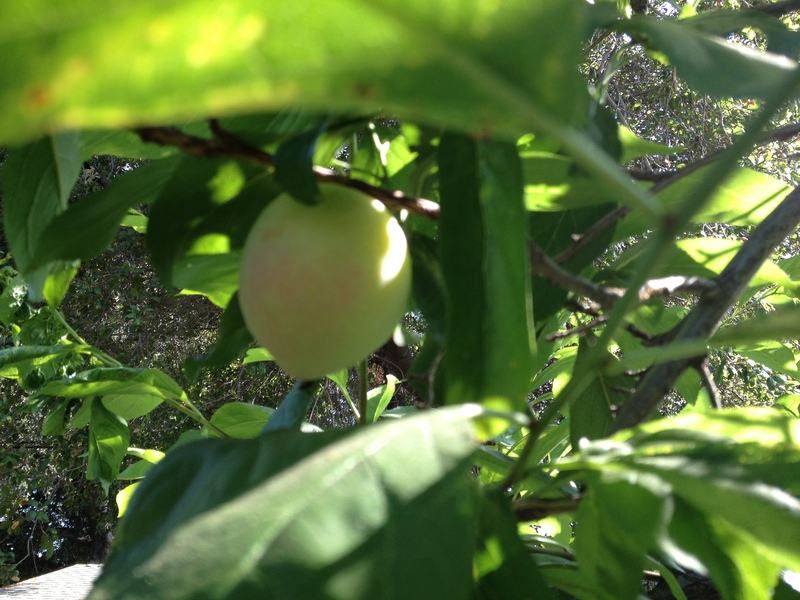 Nectarines are on their way too! 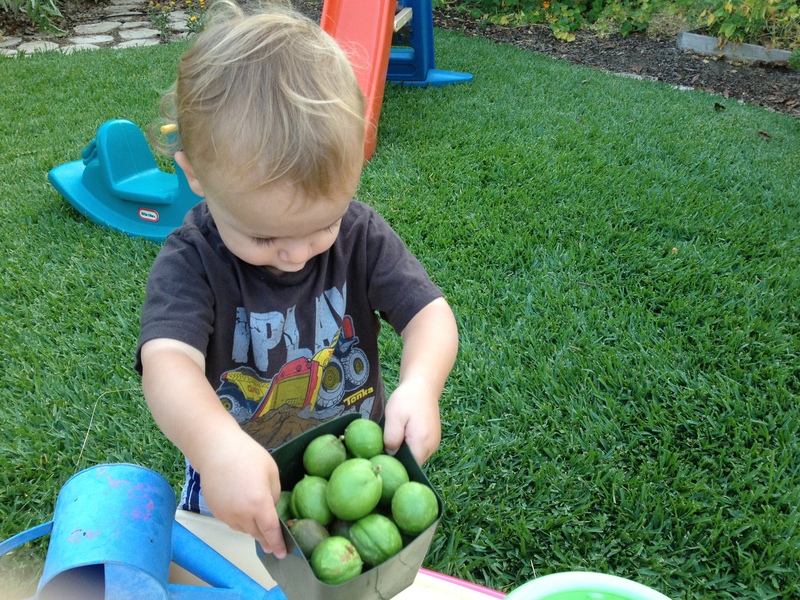 H had a blast with the thinned nectarines. Huge Disappointment: My grapes are breaking my heart. 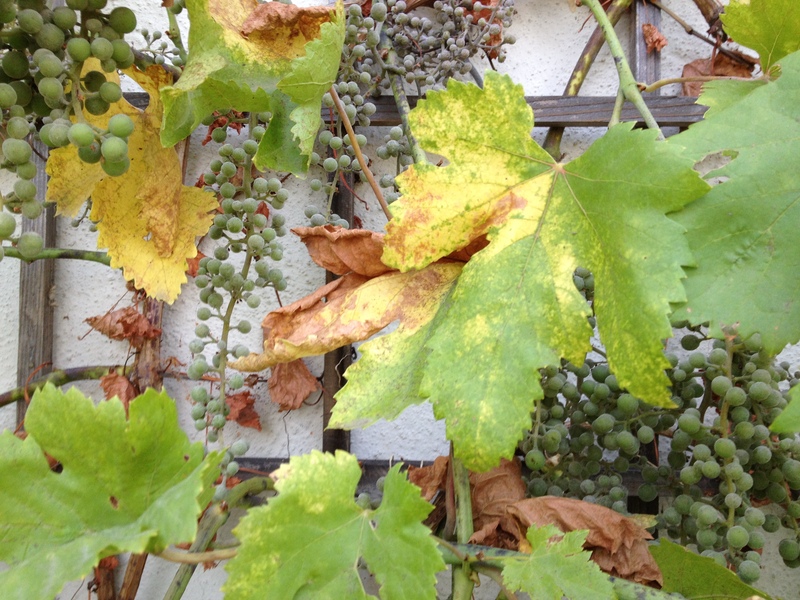 The vines are covered in bunches and also with powdery mildew. In the five minutes of research I have done on this so far, the only remedy I have seen requires the use of fungicides, which I am not willing to apply in my garden. Ultimately, it is too late for any remedy this season. If anyone out there knows an organic method of controlling powdery mildew on grapevines, I would love to hear about it. Success: To end on a happy note, I have a bed that was planted much later than the rest. It has two tomato plants, two eggplants, carrots, basil, and a sweet potato plant. All is well here, just have to get around to mulching. Looking good. Gardening is full of ups and downs, but so worth it! I’ll trade you peppers for radishes if you’ve got any! Thanks for the photos of the grapes. Sorry to hear they’re not happy. I was wondering if I had grape vines sneaking into my bean trellis from my neighbours yard and your photo helped me recognize it. LOL. Too bad, no radishes. I actually didn’t grow any this year. They are an early spring crop in these parts, so they probably would have been done by now anyway. I feel your pain. Peppers have yet to be a good crop for me. I think I’m getting closer to success though. We all just need to keep plugging away. If I ever find out what my troubles with peppers are, I will let you know. Maybe there is a secret we have not been let in on yet. 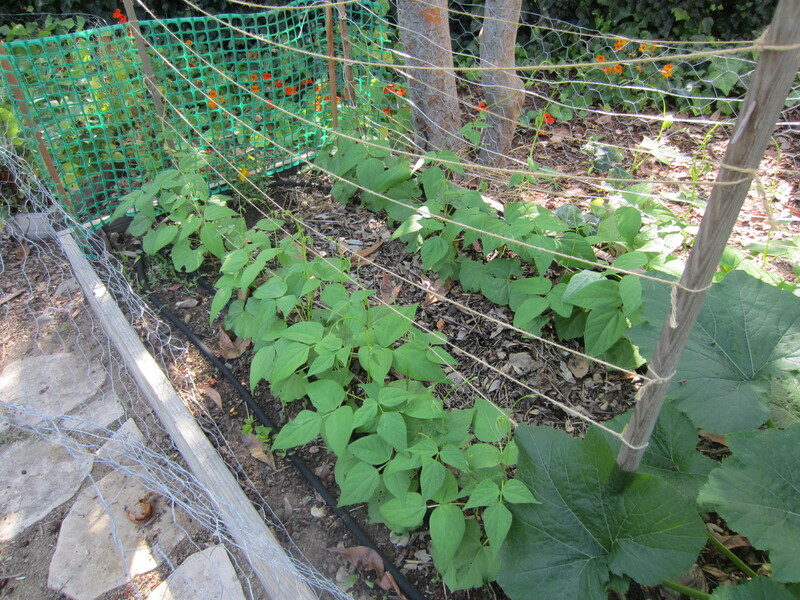 Your pole bean trellis looks like my pea trellis. I’m just hoping I didn’t plant my peas to far away from it. Should have planted them more underneath it. Oh well, we shall see how it turns out. Your garden looks great. Keep up the good work. They will probably be okay. You might have to guide them onto the trellis, so they can grab on. I have had to do that before and the plants were fine. Good luck! With the successes, come some disappointments. Your garden is looking great overall! So sorry about your grapes!! I wouldn’t want to use any products on them either, sad day! Yes, there are always ups and downs in the garden. Have to figure what to do about the grapes because the powdery mildew will just come back next year. It hangs out in the soil over the winter :(. Thanks for reading and leaving a comment! Here’s an organic approach. http://gardening.about.com/od/gardenproblems/qt/PowderyMildew.htm I’ve never tried it, though. Are you sure that’s what’s mainly ailing them? Those yellow leaves with brown spots look clean. I have a vine with 2 or 3 clusters that have some possible mildew, but the overall vine is still producing like a charm. Jane – Thanks for the link. I will have to try it next year. I am pretty positive it is powdery mildew because the berries are covered in a white powder. They look grey. Also the stems have the brown markings associated with the fungus. I think the mildew has now stopped spreading because it has gotten to warm for it to thrive, but all of the fruit has been ruined. I think I will try spraying with the baking soda next spring, as soon as the leaves start to emerge. Thanks again for the link.